There's a place, a moment, a breath of trees that, if you're lucky, you will encounter while walking through the balsam fir and white pine forests of Michigan...we call it the "sweet spot". It's there almost as suddenly as it is gone, but not before you get a chance to inhale deeply, momentarily capturing the sweetness within you. Those who know this place say that we've successfully duplicated it in our Forest essential oil blend, but we really must give the credit to Mother Nature. 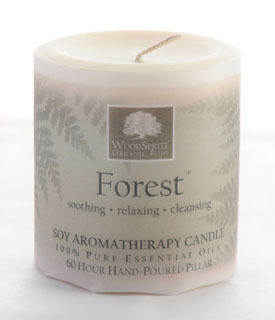 Forest contains the pure essential oils of Allspice, Balsam Fir, Cedarwood, Copaiba Balsam, Juniper Berry, *Organic Lavender, Pine Needle, Spruce Needle & Oakmoss. (*Certified Organic) 100% Plant-Fiber, Unbleached Wick. 60+ Hour Burn.